Basically 2-pane windows of various sizes filling all the obvious, bricked in, areas on the photo I took in 2011. Have found one photo of the other (northern) end and the (west facing) back of the box as well on the internet. It may actually feature in some of the PRR books I have got here, but haven't had a dig through them yet! A great shame they bricked up the windows as it was quite an imposing building. I believe it still contains signaling equipment for the line, despite it no longer being used as a manned signal tower. Presumably the windows were bricked up to make it more secure due to its continuing importance. Certainly others I have seen have not been bricked up, even if they are not in use as towers. 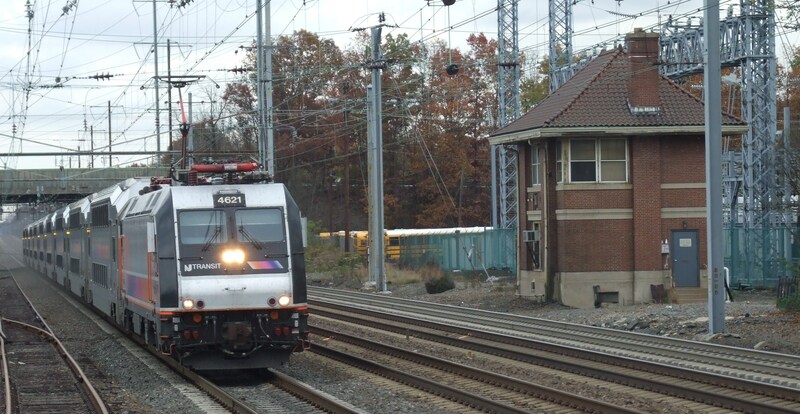 The one of a vaguely similar design below is at Princeton Jn on the Northeast Corridor. The roof is going to end up slightly higher than the original, but it still is in proportion to the remainder of the 'box. Have used my usual embossed plastic brick sheeting, some odd bits of Evergreen strip, Ratio brass window frames for the main structure, with some oddments of plastic card for the roof. I'm a great fan of embossed plasticard, even though it is overscale. Good use of the Ratio window frames, too. The embossed brick sheets I use are South Eastern Finecast ones (as far as I can work out) which my local model shop stocks at a good price compared with the other makes available. Size-wise the bricks look more like TT than N ones, but are much better than the N Slaters ones. 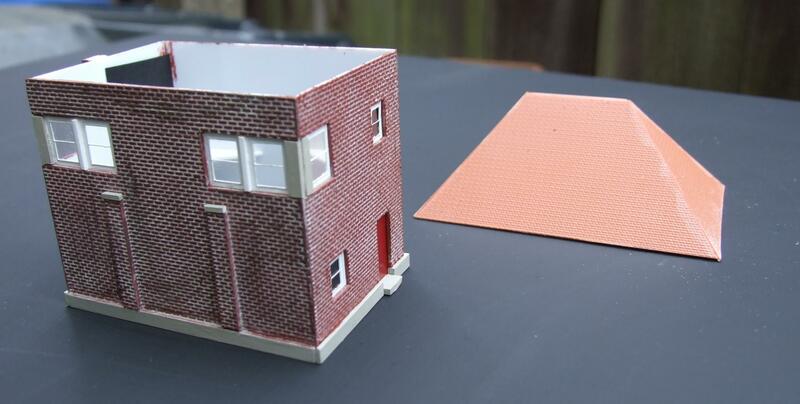 I actually use the Slaters brick sheets, which are much less defined embossings, for roofing material ! Looks like you use the same technique as me... watered down acrylic into the embossed mortar, or do those sheets come like that? Yes - Tamiya XF-55 "Deck Tan" on this one. 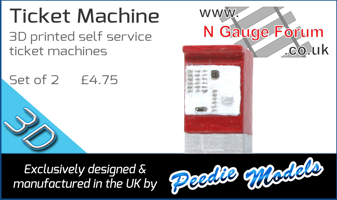 Have found this gives the best results compared with other ones I have tried. 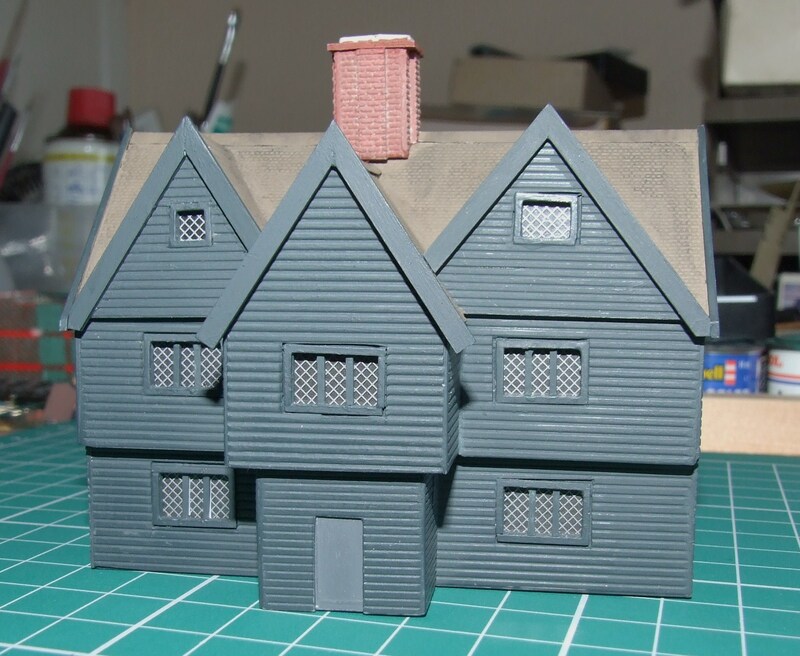 Some of the more "industrial" type buildings just get a wash-over of matt black, which settles into the mortar courses and looks more "grime encrusted" than any light coloured wash would do. That Tamiya colour has also been used on the "concrete" parts of the box as well. 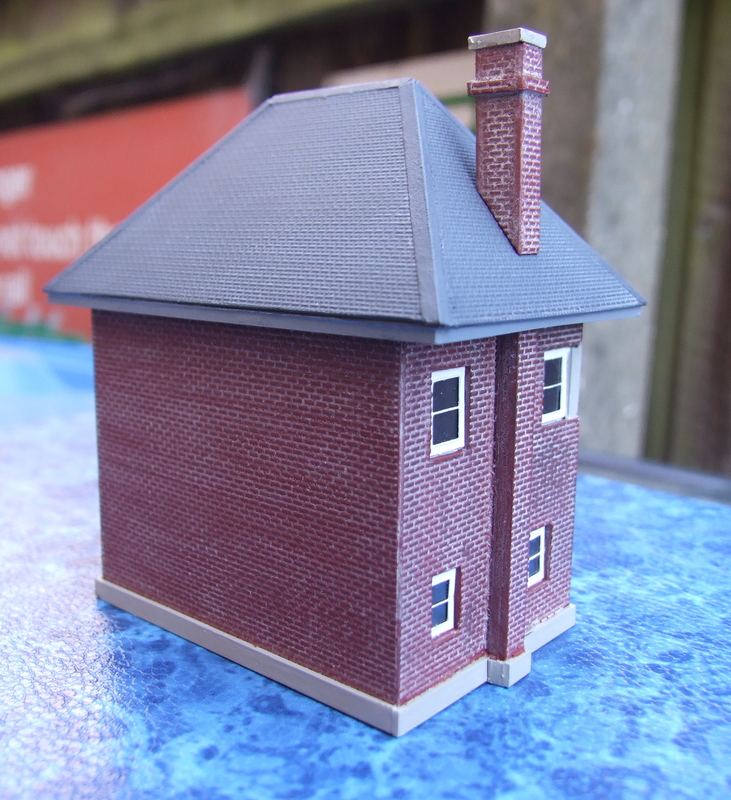 I use enamel paints for the main brick colour - Revell 37 in this case. I'm rather pleased with the way it has turned out. Will most probably build another one based on the preserved Harris Tower at Harrisburg at some stage in the future for one of the, so far, unconstructed baseboards. 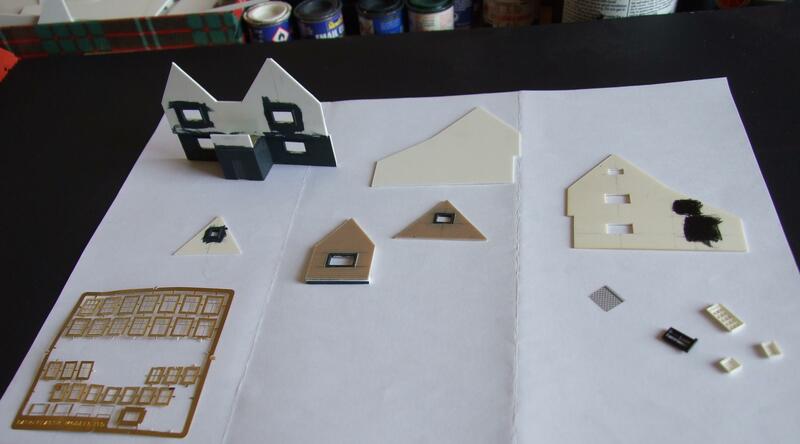 I've now moved on to constructing the Jeremy Corbyn Jonathan Corwin house that was mentioned back in posting #67. I have a couple of photos of my own, that I took in April 2012 to work from, but have been able to find pictures of the rear of the house on the internet. Nothing for the "missing" 4th side though, so that will be guesswork. Arrangement drawings have been produced, measurements being estimated from the various photos. 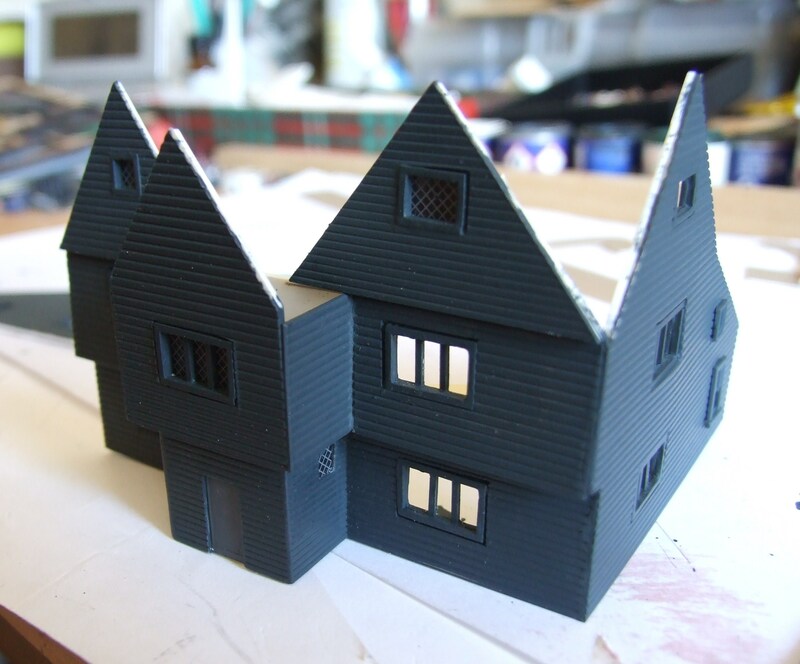 Some simplification of details has been made to make it a it easier to construct, as per the previous model of the John Whipple House. Mate, I'm comparing this to the prototype photos, and it looks great. 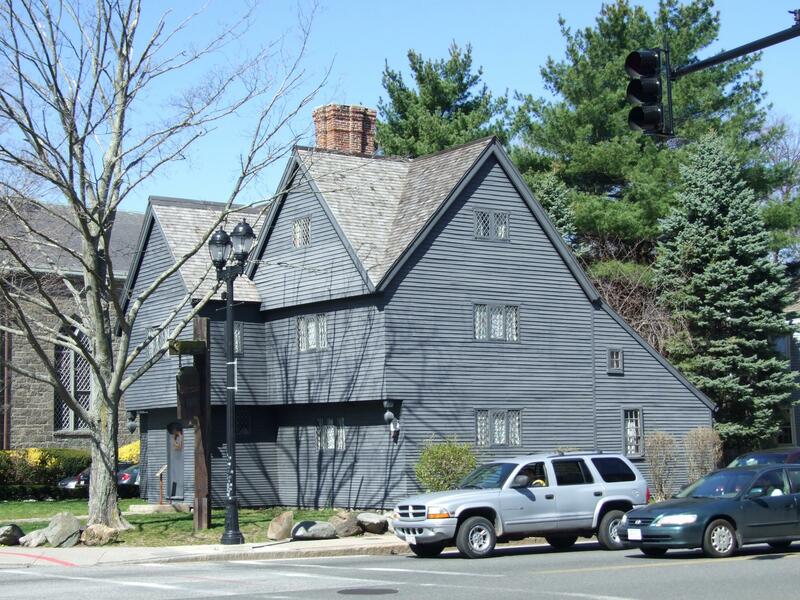 It's supposed to fit next to the Whipple House, as shown in post #66. It will fit there, but there is less room than first imagined, once I worked out how "deep" the structure is. It does still fit, but I may consider moving it to another position on one of the, yet to be built baseboards, if it doesn't "look right". Low relief is not an option in that position! 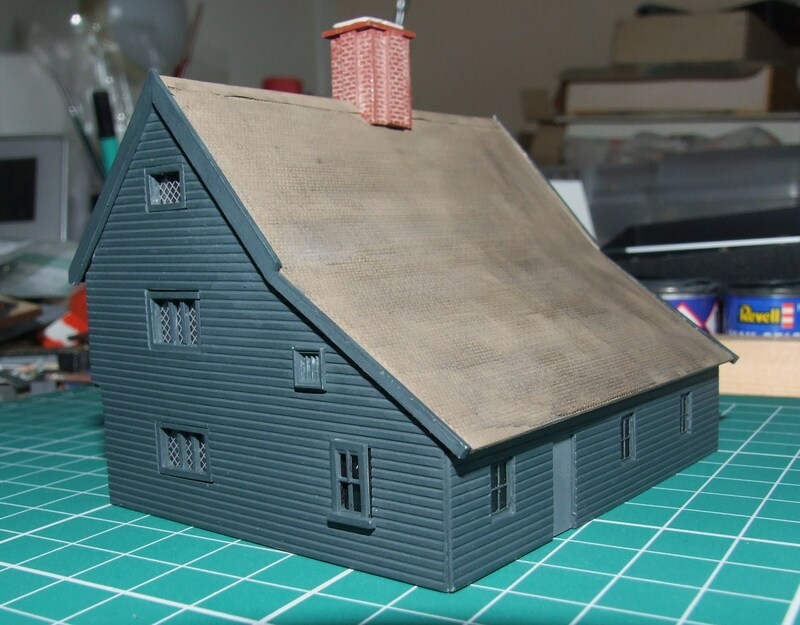 The photos are a bit "cruel" to the actual model, with the flash highlighting colour differences you cant see with the naked eye and the join between the chimney and the roof doesn't actually look that bad ! The vertical bars in the 3-part windows are certainly an improvement over the more simplified ones I used on the previous Whipple House.